Death however, has other plans for us all. We become the worst version of ourselves when we are dying. The selfish, bitter, mean and egotistical selves that we spend a lifetime from early childhood trying to repress, trying to pretend we were not, we are. Death makes fools of us all. Today marks the fifth anniversary of the death of one of the most significant people in my life. Helen died after a 12 year fight with breast cancer. At home. With my mother caring for her. The rest of us had gone away three days before. It was as if she could hang on, cling on to life while we were there, and as soon as we were gone she was able to let go. Helen taught me many things. About life. About bribery and corruption, about going outside without your shoes on and Brandy Alexanders. She nagged me, practically every single day between 1998 and 2003 about two things. Finishing my PhD and having a baby. When I did finish the PhD she continued to nag me about having the baby. Sadly, she didn’t meet Robert nor know of his existence and the promise of grandchildren he represented. Nor did she met my brother’s little girl, a sadness that only we will know. She was however, so insanely proud of me, that her enthusiasm for tales of my exploits must have driven people mad! At her funeral, which I have written about here, I cried all the tears I had in me for a good many years. I haven’t cried like that since. Here is what I said in my eulogy, which to me was the best summation of how I felt then and now. Lessons from Helen or life is too short to always put on your shoes before you go outside. Helen wafted into my life in a cloud of Arpege sometime in 1980. Impossibly glamorous to my eyes and with her irrepressible presence, she began to transform my life. I couldn’t quite believe anyone could possibly be so much fun! I loved her stories of signing her job applications with only her impressive initials (otherwise SHE wouldn’t have been called for an interview in the male dominated industry she chose for herself.) I treasured the stories about Sydney in the 60s, the cake shop, the disastrous camping holidays, overseas trips and fabulous cars. I marveled at her courage and force of will as she talked her way in to and out of many adventures. Important she thought to ‘live a little’. Helen taught me some important life lessons. She taught me about how to live. In the earliest years of our life together it was a journey of constant surprise as we got to know each other. To describe the different parenting styles of my mother and Helen as a clash of ideology wouldn’t come close to the reality. I can still recall the shock I experienced of meeting a parent who firmly believed in bribery and corruption of small children and generally making her own rules. While my mother has her own effective methods of corrupting the young, they are wry and subtle. Helen’s ideas involved lollies, McDonalds and letting us run wild. This taught me people are different, that fun is extremely important and expensive shoes are a must for the dressing up box. The running wild had a few consequences of course, and together as children, we were a formidable force of nature. This triumvirate in one memorable incident succeeded in flooding the upstairs bathroom through to Will’s bedroom downstairs. Fortunately, lego is waterproof. Battery operated toys faired less well. Helen of course was working while this was all going on, the three of us oblivious to the water pouring downstairs. When she did eventually come back to see what we were up to … well you can imagine. She worked, and worked and worked. She was never happier than when in her office. Working. I learned two key things from this, first hard work is important if you want to achieve anything, and secondly, too much work is not always the best thing for your family. Balance is important but I learned this only tacitly from Helen, to observe her was to see the absence of a sense of balance. I also learned that you shouldn’t wait til you’re 64 to get all your hair cut off. 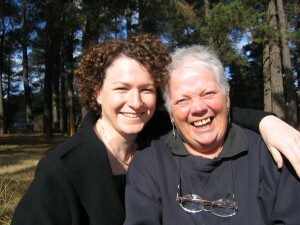 When she and mum both had their heads shaved prior to chemotherapy, our family was finally free of hairspray forever. No more bobby pins in the vacuum cleaner! We could finally see her without the artifice of the french roll she had worn for at least the previous 30 years. I looked at the before and after photos in shock, why hadn’t she done it years earlier. It was fantastic. I remember mum coming to Sydney with her newly shorn scalp and being so cold she had to wear a hat! But short hair always suited mum. The difficulty of the years of cancer treatment weighed heavily on both of them. My impatient and fast mother learned patience and how to be slow. It took us all a while to adjust to the Helen who was flat and lacked vitality. I used to be secretly pleased when she’d ring me after doing something dreadful like mopping the floor when mum was at the shops – she’d be breathless and tired and knew full well she’d pay for the exertion. As much as anything she did it so she could feel like she could still be HER. That and to satisfy her clean floor obsession – god help you if you trod in her dirt while she swept! Mum of course invariably did. Of course I admonished her at the time for being so stubborn but I think now how glad I was that she could still muster the energy to mop floors, go paddling, work, and of course take two long overseas holidays. It was a heavy burden for mum who wore it lightly – most of the time. It’s been difficult for all of us. But somehow we managed to laugh – we three siblings reunited in December 2007 immediately regressed 20 years over dinner and washing-up and cheered ourselves up enough to deal with the next day. Her fight to the end became hard too. To the end she wanted to get better. I remember seeing the oncologist Fran Boyle in 2005. She asked Fran when she would get better. She never really believed that she wouldn’t. Even when dying, she still asked when she would get better. She transformed all our lives in her maverick way. The sacrifices that each made for the other can only be partly seen by those outside. They gave the three of us a unique new beginning. They gave us education, they gave us experiences and they gave us opportunity. Helen loved us all fiercely; there were no half measures. She taught me many things. I would like to think that she helped shape all of us. She certainly was a precious gift to me – without her I wouldn’t be who you see today. Helen taught me many things, finish what you start, when you are overseas and you see something you like, buy it, because you will never go back and after all, it’s only money, to mop a floor takes longer than you think and more than one bucket of water, a proper cake is DRY, full stop! And on the all important matter of taxation, paying it is highly overrated and should be considered optional and avoided where possible. Helen loved a good picnic. Love is a precious commodity and should be fought for. Love your work. Love your family and beautiful things. There are two sorts of people in the world, those who experience time in measured linear increments and those from whom it just flows away. Time just flowed away from Helen. Be memorable. Don’t worry what other people think. And remember; girls can do anything. A beautiful post, Stella… a very kind tribute to your friend. Thank you for sharing. What a wonderful post, and fantastic writing. Helen sounds remarkable. I have sat with my thoughts on this beautiful writing. Not sure how to best reply. A comment seems such a small thing for a woman so full of love, both Helen and you. So fun. Outrageous but so fantastic! A very beautiful tribute. Thankyou for sharing it. It was very good to write it. This is so beautiful. And then I went back and read the crying post again.